The annual figures for special educational needs came out yesterday and I spent the day poring over them and making another nice infographic to go alongs with it. 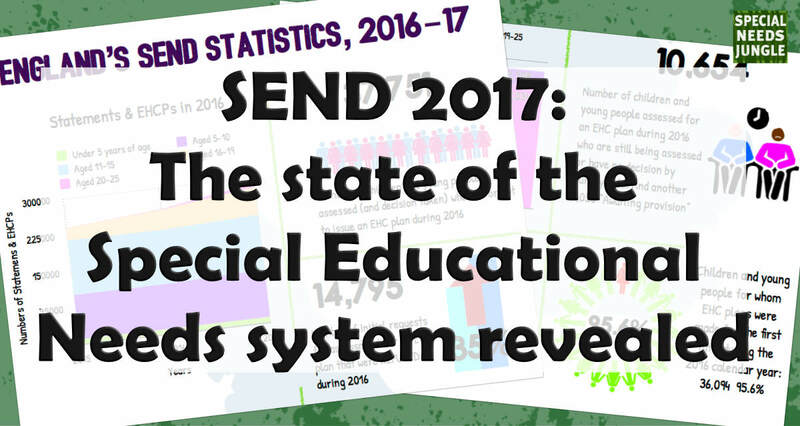 2016 saw a 12% increase in the number of children and young people with legally-backed special educational needs support plans, whether an Education, Health and Care Plan (EHCP) or the old statement of SEN. This makes a total of 287,290, an increase of 30,975 from the year before. The combined number of children and young people with statements and EHC plans has increased each year since 2010. 10 local authorities refused more EHC needs assessments than they carried out last year. One was The SEND Minister, Ed Timpson's local authority and another was Theresa May's. What’s behind the rise in applications for EHCPs? The 2014 reforms extended the age range upwards to young adults up to 25 who were still in education or training. This last year, the numbers aged 16-25 with plans rose seven-fold (albeit from a very low base) so this is a large part of the reason. However, with the cuts in education, we know, anecdotally, that parents are worried that their children won’t get the help they need without a plan that comes with its own funding. There were 36,094 children and young people with new EHC plans made during the 2016 calendar year. However, there is still a huge mountain to climb in transferring children with statements to high quality EHCPs to meet the government deadline of April 2018. At the census date, LAs have still only managed to deal with about 45% of statements. From this data point, they’ll have 14 months to transition 120,000 statements over – so they’ll have to nearly double their pace, or they won’t make the deadline. Going only at current pace, it’ll take until well into 2019 to get the job done. The DfE is well aware that LAs are heading to fall well short of meeting the April 2018 finish line; which is why they’ve asked LAs to report monthly on their progress with transition cases. At the moment, only 19 LAs are currently on track to meet the April 2018 deadline. In fact, it’ll take some LAs much longer than 2019 - fifteen of them have not even completed a quarter of their SSEN transition caseload. The number of young people 16-19 with EHCPs has been slow to rise. As these were the first target for transfer from LDAs and statements, you would have thought that, if properly implemented, there would have been bigger rises in 2015 and 2016. However, the trend is now upwards as mentioned, though clearly many who had statements are not moving on to EHCPs and there are still low rates of EHCPs for those 19-25. Of course, you would expect that there will be fewer if some move into work, or even higher education. However, with the range of provision that is ‘supposed’ to be available such as apprenticeships, supported internships and specialist post 19 provision, you would expect these numbers to be higher by now. This is an area that definitely needs more attention by government. There are still low numbers of Post 16 young people with EHCPs in an apprenticeship (292); Traineeship (300) or Supported Internship (715). This is across the whole of England, although some LAs did not provide figures for this. I wonder why? The most Apprenticeships were in Surrey with 22, Traineeships in Norfolk with 44 and Devon had 31 Supported Internships. While these still are not great, they are better than anywhere else in the country. Success: It’s a complicated picture of course, as it always will be if you are looking at date ranges rather than applications as the benchmark. However, it’s still clear that when a child is assessed, they are highly likely (95.6%) to go on to have an EHCP drawn up. Waiting: But while 36,094 got new EHC plans during the 2016 calendar year, a further 10,654 children and young people were still waiting for assessments to be completed or decisions to be made. Worryingly, 4,050 were listed as “awaiting provision” in no-mans-land - a figure that has more than doubled since last year, and is over five times larger than in 2010. What is happening to them? We’ve already mentioned the large number of statements still to be transferred, but how many make it from statement to EHC plan (or from a new application) within the legal 20-week deadline? Shockingly, just 10 out of 152 LAs managed all their caseload within 20 weeks. These do not include ‘exceptions’ such as summer holidays, very late reports etc. The headline figure of 59% completion for 2016 masks a lot of variation: 80 LAs did better than in 2015 and 65 LAs did worse. London and the South East did much worse in 2016 on the whole, with some exceptions. And obviously, there’s no way to judge EHCP quality from this. Across England, while the percentage of plans issued within the timescale has fallen, in terms of number of plans, more than 11,000 more were issued within the timescales. However, I know that at least some of these involve cases where the final plan is issued to meet the deadline and then put straight back into draft, because it’s nowhere near finished. Secondly, of these plans that made the deadline, was the quality good? Did they include new assessments for education and health (where needed) or social care? Were the parents involved? Thirdly, you’re still looking at thousands of children whose plans have taken much longer and who are without proper provision while they wait. Why are LAs not meeting deadlines? The large increase in applications, coupled with a lack of capacity to process them, has to be one of the biggest reasons. Also, with a complex plan that needs health and social care input is very unlikely to get the assessments done, sent in and written to any standard within the time allotted. I know budgets are being cut, but LAs have been given a lot of money from central government. LAs need to look at how this money is being spent. We have evidence that of the cash that has been dished out, chunks of it has been diverted by council leaders away from SEND (see our manifesto from earlier this week) This is just not good enough and parents need to lobby their councils and their MPs to ensure this stops. SEND money is for children with special needs, not other areas. The DfE MUST face up to the fact that they will always be failing disabled children until they do the sums properly and fund accordingly – AND ring-fence it. After all, the Government doesn’t seem to find any problems finding money for Trident missiles, MPs expenses, chauffeur-driven cars or Ministers’ golden parachutes, why is it having such a hard time finding it for the things that really matter, like education? Between January and August 2016, 887 young people with LDAs who were assessed did not receive a plan. Even worse, by January 2017, 1,824 children and young people with statements were assessed for transfer and “A decision was made not to issue an EHC plan”. On top of this, 4,400 children whose families move to another area have lost their statutory plans. This is clearly a breach of what the government promised would happen and any family to whom this has happened should take it up with their LA and, after the forthcoming election, their MP. This is just not good enough. There are some particular offending outliers here: Lancashire & Trafford both turned down 11%, Cambridgeshire turned down 12%, Buckinghamshire and Camden turned down 17%, Cheshire West & Chester turned down 24%, whilst Dudley turned down 1 in 3 of every statement it was due to transfer to an EHCP. One in three, for a process that was supposed to be seamless. Did this happen in your LA? Check out the Stats file, Table 9. Despite the fantasy of ‘inclusion’ in mainstream, the numbers of children and young people in special schools is rising.Children with statements and EHCPs are split between mainstream settings (44.8%) and special schools 42.5%. 4,600 more went to a special school this year and the numbers are rising faster than those with EHCP in mainstream. If this trajectory persists, they will be broadly equal in number next year. Of all the EHCPs issued or reviewed in 2016, ONLY 6,442 had personal budgets. The Personal Budget was one of the key new inclusions in the new system whereby families who needed provision that wasn’t readily available such as specialist therapies, speech and language, out of school provision, could have them funded with a separate pot of money paid either directly to the provider, or to the parent to fund the activity as a direct payment. I think it’s fair to say that, from these figures, Personal Budgets have so far been a giant flop. Why? Well, clearly, not every child with an EHCP needs provision that can only be met with a PB; but of the 175,233 children and young people with a plan, I’m sure more than six and a half thousand could have benefitted. Were they not told about them? Were they not explained properly? Did the parent not have the support they needed to ask for one? How many parents asked but were refused? These are all very important questions. Note: The figures here are not absolutely accurate due to the way some LAs reported their numbers, but even so, they won’t be hugely different. So, too many statements perhaps issued in old SEND World? Or grwat shame on Lancashire & Trafford who both turned down 11% of statement to EHCP transfers, Cambridgeshire who turned down 12%, Buckinghamshire and Camden who turned down 17%, Cheshire West & Chester who turned down 24%, whilst Dudley turned down 1 in 3 of every statement it was due to transfer to an EHCP. SHAME! 》enforcmentioned of quality standards rather than leaving quarter of a milion families with EHCP and very many practitioners to work it out for themselves? 》supporting the pvi in any way whatsoever – so they can continue to prop up the system and help parents take the strain. Thanks for all your hard work in pulling this together SNJ team – it is indeed making my head spin! Shocking state of affairs 🙁 Where is the accountability? Who can make the LAs do the right thing, rather than the wrong and illegal which is clearly happening here?! Refusal to assess, shouldn’t be happening. Brilliant to read someone expressing that the SEND community needs to start lobbying LA’s and MP’s. For nearly 2 years I have been referring to the ‘Perfect SEND storm’ and it is now on the horizon. Please share our page. I am not a trouble causer, I am Billy’s dad and I have practically begged to support my local area to implement the new legislation. I dare you to look at our facebook page: They Speak for me, SEND parents Unite. Make your own judgements but we need one of these in ever local area to be heard.